RIO DE JANEIRO, Oct 2 2015 (IPS) - Brazil’s greenhouse gas emissions reduction programme, hailed as bold, has nevertheless left environmentalists frustrated at its lack of ambition in key aspects. “The decision to present absolute reduction targets is praiseworthy, but they could be better and more ambitious, to the benefit of the country itself and of the global climate change talks,” said André Ferretti, general coordinator of the Climate Observatory, a Brazilian network of 37 environmental groups. 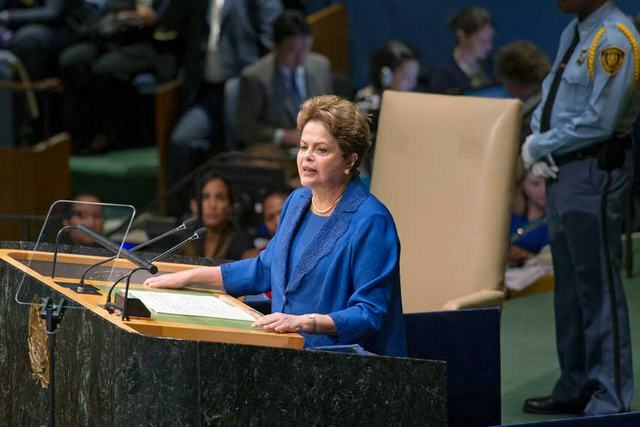 On Sep. 27, President Dilma Rousseff announced at the Sep. 25-27 U.N. Sustainable Development Summit in New York that Brazil’s goal is to cut greenhouse gas (GHG) emissions by 37 percent by 2025 and 43 percent by 2030, with a base year of 2005. This is Brazil’s Intended Nationally Determined Contribution (INDC) to keeping the global temperature rise below two degrees Celsius this century, the ceiling set by experts to ward off a climate catastrophe. Each country had until Oct. 1 to submit its INDC, to be incorporated into the new universal binding treaty to be approved at the 21st yearly session of the Conference of the Parties to the 1992 United Nations Framework Convention on Climate Change (UNFCCC), to be held Nov. 30 to Dec. 11 in Paris. In order for Brazil to meet these goals, at least 45 percent of its total energy mix is to be made up of renewable sources, including hydropower, by 2030. The global average is just 13 percent, the Brazilian president pointed out. Alternative sources like wind, solar, biomass and ethanol will account for 23 percent of the country’s electricity output, up from nine percent today. In addition, the country will attempt to eliminate illegal deforestation in the Amazon rainforest and pledged to offset emissions from regulated deforestation. Reforesting 12 million hectares and recovering 15 million hectares of degraded grasslands are other goals announced by Rousseff, who noted that Brazil is one of the first countries of the developing South to assume absolute reduction targets for cutting GHG emissions, with goals even higher than those set by many industrialised countries. Other countries offer reductions with respect to projected future emissions, based on current rates of production, consumption and economic growth. At the COP15, held in 2009 in Copenhagen, Brazil promised to reduce its GHG emissions by 36 to 39 percent below its projected emissions for 2020. But the country’s INDC goals “are still lower than what the country could achieve, and add very little to what has already been done,” Ferreti told IPS. In 2012, GHG emissions had already been cut 41 percent with respect to 2005, basically due to a lower rate of deforestation in the Amazon, although they rose later because of greater use of fossil fuels. Currently Brazil, Latin America’s biggest GHG emitter, releases nearly 1.48 billion tons a year of emissions into the atmosphere. The target for net emissions for 2030 does not differ much from the 1.2 billion tons of carbon dioxide released in 2012, according to the Ministry of Science and Technology. “In legal terms, it is contradictory to set such a lengthy timeframe to combat an illegal activity,” former lawmaker Liszt Vieira, who directed Rio de Janeiro’s botanical garden for 10 years, told IPS. Furthermore, the targets only refer to the Amazon, leaving out other ecosystems, such as the Cerrado, the savannah that covers 203.6 million hectares, or 24 percent of the national territory, and is suffering heavy and growing deforestation, said Ferretti. “All of this reflects the Brazilian government’s weak commitment on this issue,” said Paulo Barreto, a senior researcher at the Amazon Institute of People and the Environment. “Brazil could assume a zero deforestation goal for 2030, which would be feasible because this country has learned a lot about the issue, has the necessary technology, and has land that has already been deforested, for the expansion of agriculture. “That’s why a good climate accord in Paris would be good for Brazil,” to prevent extreme events like drought, he said. 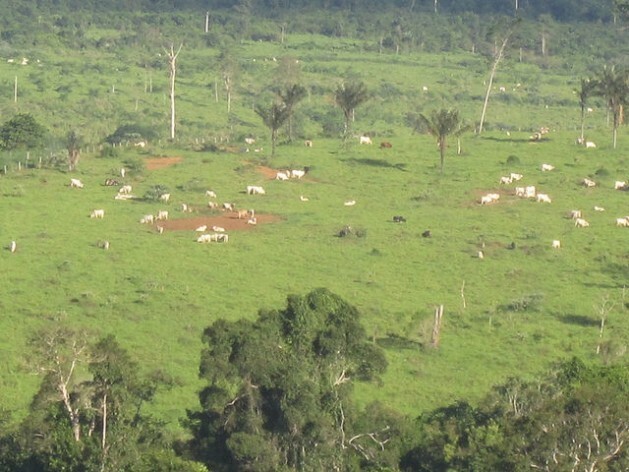 An ambitious goal, like zero deforestation nationwide, would give Brazil a certain leadership role in the climate conference, to encourage contributions from other countries and the reaching of agreements that would make it possible to limit climate change to less disastrous levels, said both Barreto and Vieira. Furthermore, the role that forests play in regulating rainfall, especially the Amazon jungle in South America, is understood better today. Brazil could also present more ambitious goals with respect to energy from alternative sources, expanding investment in wind and solar energy, said Vieira. In energy, the country is going against the current, he said, increasing generation of thermal power with fossil fuels and putting a priority on producing oil from the pre-salt deposits discovered beneath a two-kilometre-thick salt layer under rock, sand and deep water in the Atlantic. Vieira believes Brazil has lost the leadership role it had in environment and the climate for nearly two decades, since it hosted the 1992 U.N. Conference on Environment and Development, or Earth Summit, in Rio de Janeiro. In his view, it is the big players in the issue – China, the United States and Europe – that will decide the future of the global climate. But despite the limitations of the government’s national climate programme, the environmentalists consulted by IPS admitted that Rousseff’s announcement was a happy surprise. “We expected something worse from a development-oriented government that has treated environmentalism as an obstacle to development and economic growth,” said Vieira, who formed part of the current administration until 2013, as president of the botanical garden, a position of trust in the Environment Ministry. “And it was good because, besides some good measures, such as the recovery of degraded land, goals were set for 2025 and 2030, indicating that they would be revised every five years and could be expanded, opening a door to negotiation with and emulation by other countries,” he added. It was also positive, he said, because Brazil abandoned its stance of inflexibly defending “common but differentiated responsibilities” exempting developing countries from meeting the same kinds of targets, as they are not equally responsible for the problem of global warming. That separation between the two blocs boosted the “Third World” leadership by some countries like Brazil, but hindered negotiations, Ferretti argued.